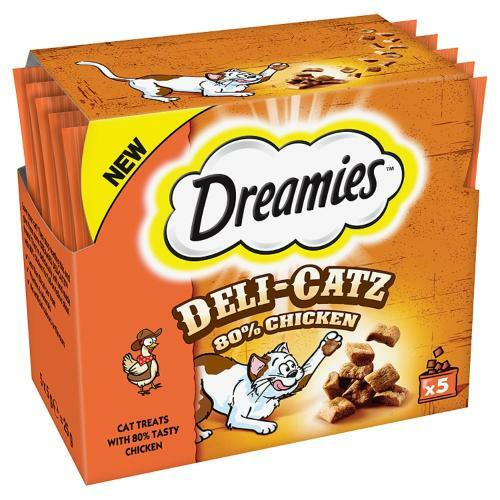 Made with 80% chicken, turkey or beef Dreamies Deli-Catz treats have the mouth-watering taste cats crave and deliciously soft and tender texture that cats find irresistible. Each serving is packed in stay fresh packs to retain all that irresistible flavour. Each delicious treat contains less than 2kcal with absolutely no artificial colours or flavours. If you can read this, then this pack of soft and tender Dreamies Deli-Catz treats, made with 80% chicken, turkey or beef is too close to your face and too far from your cat's! Feed up to 1 sachet per day. Please reduce main meal accordingly. Use each sachet within 1 day of opening. Fresh drinking water should always be available.